Inspired by Judy Chicago, I’ve created a virtual dinner party: One category of my blog will be dedicated to honouring women who I want to be a part of my soul community. Each woman at my virtual table has a lesson to teach, even if it’s simply to inspire us with her ability to hold greater aspirations for ourselves than we’d ever thought possible. Each one will be a manifestation of the Goddess, a Wise Woman, a pilgrim on the road of the Sacred Feminine. I want to share the wisdom of these women as part of my community of support. If I were to sum up most of the cases I’ve had in my practice over the years, I’d have to say that women come to me feeling like a greyed-out version of themselves and frustrated at unable to access the full-colour self they know and love. This may sound really strange, but I get really excited when they come right out and say, “I don’t feel like myself.” It turns me on because that’s the moment of greatest possibility: these women know what they want…they simply need some direction to get there. 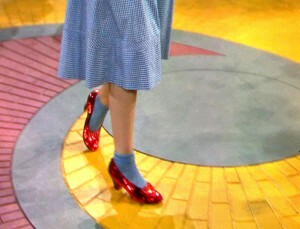 Every time I watch The Wizard of Oz, I get a chill when Dorothy gets to Oz and this strange, technicolour world. She may be scared & confused, but her mind also quickly opens up to the opportunity for something she hadn’t quite imagined. Glinda tells her she can get what she wants – to go home – and sets her on the path that will get her there. Along the way, she finds others to accompany her, mainly because they too want something from the wizard, but she also learns valuable lessons that help in her journey. She discovers things about herself that she hadn’t considered before. The first of which is trust: she trusts what the Good Witch has told her and heads out full of hope that she’ll get there. The Wicked Witch, of course, comes along and tries to derail her efforts by playing on her fears. Sound familiar? Maybe you don’t have someone throwing fireballs at you and your straw friends or chasing you with flying monkeys, but the prospect of stepping out of your comfort zone gives you pause, doesn’t it? If there’s one thing we humans rail against (no matter the potential outcome) is change. It scares us as much as a fireball. Or we zone out as if we’d walked into a field of poppies. It’s that moment of panic when you’re not ready (or willing) to step off the edge of familiar. And so you continue to wander aimlessly around the dark forest, looking for the wizard with the quick fix, because you don’t trust the yellow-brick road laid out before you. Or, more likely, you don’t trust yourself to follow it. The one thing that keeps Dorothy putting one foot in front of the other towards the Emerald City – besides the fortitude of company and a few catchy tunes – is the fact that she keeps her eye on the prize. She wants to go home, just as my clients want to return home to themselves, and she’ll do what she’s gotta do to get there. She even goes so far as to seek out the witch – confront her fears and discomfort directly – melting her into oblivion in the process. At every step, she lets her desire for what’s possible outweigh the fears, the mishaps and hard work it takes to get there. She discovers her determination and inner strength. The very energy that charge her ruby slippers with the super-power she had all along. One of my super-powers is the ability to decipher the path that will get you from the B&W world of where you are to the technicolour place you want to be. You could say I’ve cast myself as the Good Witch in this particular movie. And just like Glinda, I show up regularly to keep you focused on your goal when the way gets clouded with fear and uncertainty. Do you have an image of what the technicolour version of your health and life look like? 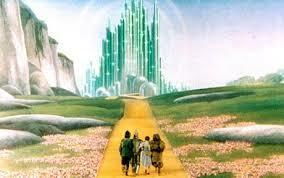 Contact me today and we’ll figure out how to get you onto that yellow brick road. Have any friends searching for the road to vibrant health? Send them this post using any (or all!) of the share buttons below. This entry was posted in Soul Bites and tagged beliefs, inner strength, intentions, power of choice, resistance, taking action by Cathy Cochrane. Bookmark the permalink. I love this! Change can be overwhelming and scary, sometimes even seeming impossible. When taken in small steps, it is amazing what we are capable of. Letting go of the excuses and just focusing on what needs to be done next. Thank you for sharing! change is indeed difficult – we love to stay in our safe cocoons, don’t we? over the past several years, i’ve been introducing BIG changes into my life at regular intervals. it’s always scary and unfamiliar, but i feel myself grow in so many different ways. and, best of all, i escape stagnation. great post, cathy! I think the part we forget is that even after we change, we need to learn how to navigate the new normal. The other side of the rainbow will be temporarily scarier than the Kansas we left behind.